Last summer had a wonderful opportunity to complete 6 hikes in 4 days. I was fortunate again this week to have the same opportunity, completing 6 hikes in 6 days (Sunday through Saturday with a day off on Monday). It was the same time of the summer – the waning days of July and the first of August. The kick-off hike was once again with my friend Lelia, tackling a long hike that I had long desired to try. Last year, it was Mount Ellen, allowing me to complete my 4000′ Vermont mountains. This year, it was Tunnel Brook Ravine, a legendary bushwhack on the backside of Mount Moosilauke. I wrote about that epic trip last week. After a much-needed rest day on Monday, I headed for Crawford Notch in the White Mountains. As before, I was fortunate to be staying at the Mount Washington Hotel for a few days, which is an excellent base for beautiful hikes both short and long. 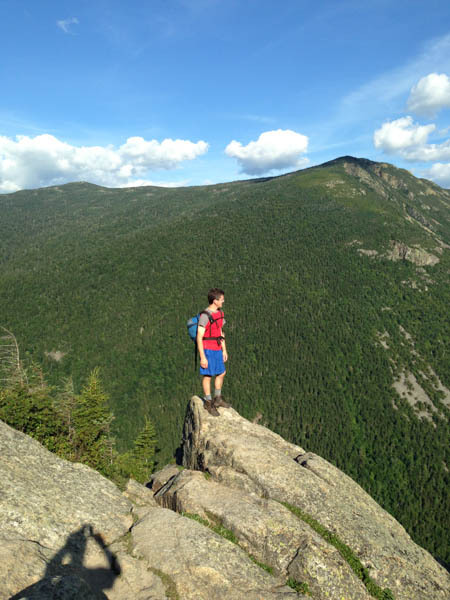 I revisited two favorites from last year – Mount Willard and the two Sugarloafs – with another friend Jon. For the first time I climbed Mount Martha, which has an astoundingly beautiful view of the Presidential Range. After the meeting concluded on Friday I bopped up Crawford Cliff, dodging a thunderstorm, and on Saturday at home I revisited the local Lyme Pinnacle for a quick overview of the Upper Valley. I snapped a few photos along the way (SmugMug). Good weather, beautiful mountains, and wonderful friends. A great week! For nearly thirty years I’ve wanted to climb Moosilauke via Tunnel Brook Ravine, a classic bushwhacking route through a deep ravine on the west side of the mountain. I have fond memories of a solo bushwhack up Gorge Brook, past Last Water and the Pleiades, following the brook until it petered out and I was crashing through krummholz. As I sat on the summit, surprisingly alone on a sunny summer weekend afternoon, I watched with curiosity as a single hiker strode up the west slope of the summit cone, crossing the fragile alpine vegetation as if he was unaware of any trail. It turned out to be my Dartmouth classmate Alex, who had just bushwhacked up Tunnel Brook Ravine.